Pink cherry blossoms displayed in a variety of glass vases make simple but beautiful table decorations, an easy DIY project for your wedding, photo by Eric Hegwer. You don't always need a big wedding cake to make an impression. These pretty little pettie fours with delicate cherry blossom sugar flowers look divine. 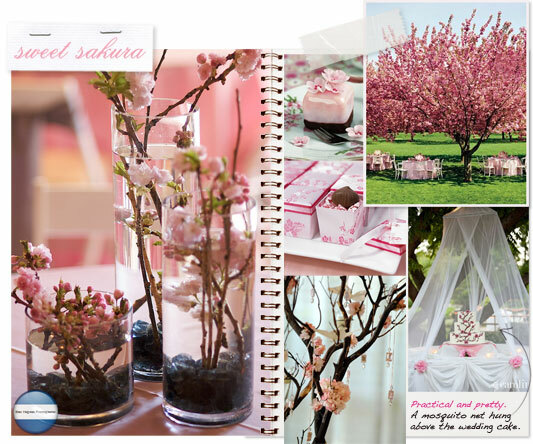 If you're lucky enough to find a venue with cherry blossom trees, why not set up the reception outdoors? Try botanical gardens or orchards. Pic via Martha Stewart Weddings. Pink Asian brocade favour boxes can be used in lots of ways, $3.95 for a packet of six, available through Moonlight and Whimsy. Bare manzanita branches decorated with crystals, paper butterflies and flowers are perfect for the ceremony or reception, pic via project wedding. Keep your wedding cake safe from outdoor nasties AND create a beautiful backdrop at the same time! A simple mosquito net hung above the cake looks amazing. Photo by Caroline Tran. I adore cherry blossoms ~ what a beautiful style board!